A gardening extravaganza is soon to take place, on May 11th, at the garden of Margaret Roach in Copake Falls, NY. (Margaret is a great gardener and was editor of Martha Stewart Living magazine.) 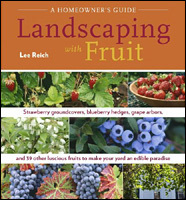 It is a Garden Conservancy Open Day at her garden, I’ll be doing a presentation on “Fruit Growing Simplified” as well as a hands-on “Grafting Workshop,” and Broken Arrow Nursery will be selling plants. 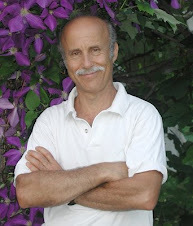 For more information and registrations for any of these events, see http://awaytogarden.com/2013-open-days-in-my-garden-and-nationwide. disease such as ominous-sounding, and truly debilitating, valsa canker. Trees typically die either quickly or slowly. If only that were all . 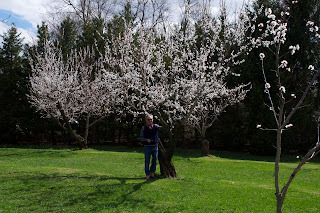 . . Apricot blossoms open at the first hint of spring warmth. The pinkish buds unfolding against the brownish red stems are a beautiful and welcome sight on the heels of winter, but those early blooms could -- usually are -- knocked out by subsequent frosty weather. Damaging, late frosts are least likely to occur near large bodies of water, such as the ocean and Great Lakes. Late frosts are most likely to occur in low-lying regions into which cold air sinks on still, spring nights; that would be here on my farmden in the valley of the Wallkill River. If only that were all . . . Even if the trees stay alive through winters and their blossoms escape spring frosts, the fruits themselves are the target of a number of insects and diseases. Plum curculio, oriental fruit moth, brown rot, black knot . . . the list goes on of afflictions that can reduce the crop to zero. Oh, and did I mention squirrels. My father had a tree that every Father’s Day was stripped of every one of its small, green developing fruits by squirrels. Did you ever taste a perfectly ripened apricot, one that’s soft and ready to travel no more than arm’s length from the branch to your mouth? I have (when I worked at the USDA Fruit Laboratory and at a friend’s orchard; he has a good site). Perfectly ripe, the fruit tastes nothing like a lemon, as market apricots usually do, but has just a hint of tartness to offset its rich, sweet flavor. For that, I planted the tree. 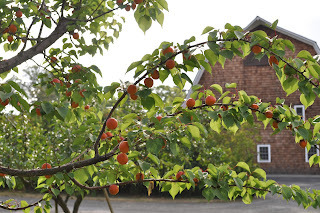 I wrote that “apricot is unlikely to bear fruit.” “Unlikely” does not mean “never.” A crop of apricots even one year out of -- say -- every five years will justify, for me, the space and trouble the tree will entail. I was smart in a couple of ways with my apricot tree. 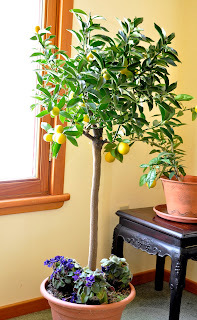 I bought it from a nursery that specializes in fruit trees (www.cumminsnursery.com) and I planted in full sun in well-drained, moderately fertile soil. And the variety is Jerseycot, one of the varieties most resistant to some of the pests and the vagaries of our winter and spring weather. restrain myself realizing that the plant might survive but would never become a majestic specimen the tree is meant to be. Citrus? I resign myself to growing some citrus in pots, indoors in winter and outdoors in summer. The last few years have seen the development of hardier camellias. Long Island Pink is one of the hardiest, with compact stature, glossy evergreen leaves, and single pink flowers in autumn. Still, it’s not really hardy here. I’ll plant it in the partial shade near the northeast corner of my home, protect it through winter its first few years as it develops cold-hardiness, and perhaps my foolishness will pay off. I read those descriptors carefully to narrow the field. 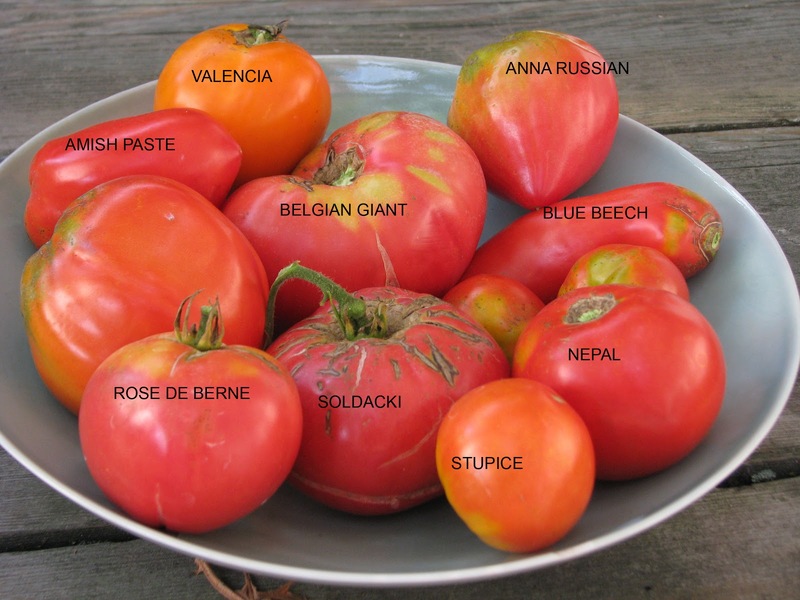 For starters, I avoid any tomato listed as “determinate.” Determinate varieties grow by branching repeatedly because each stem ends in a cluster of fruits. The plants are compact and ripen their fruits over a short season, which appeals to commercial growers. Downsides are that their lower leaf to fruit ratio results in poor flavor and concentrated ripening causes more stress and, hence, susceptibility to diseases. So I grow only “indeterminate” varieties, whose clusters of fruits hang from along their ever elongating (indeterminate in length) stems. 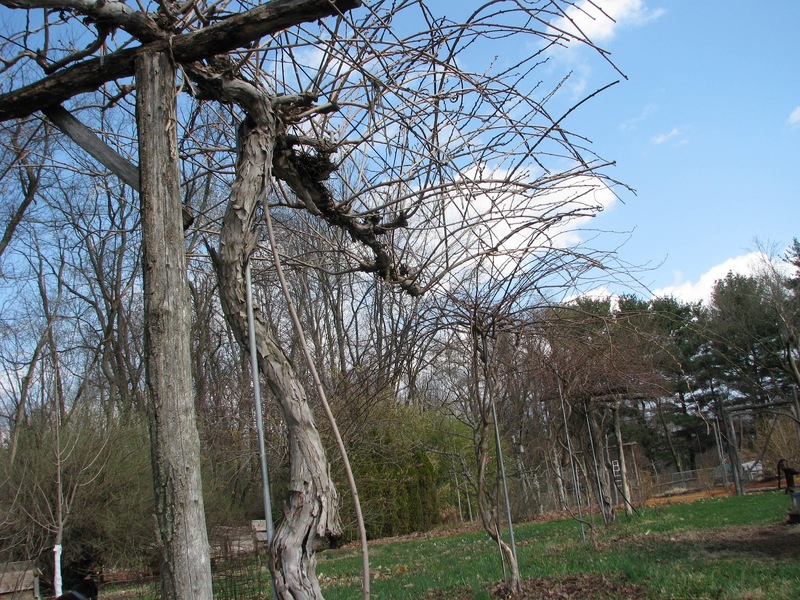 These are the varieties that can be pruned for staking. Short of tasting a particular variety of tomato, the next descriptor that would guide me is whether or not it’s a “potato leaf” variety. Yes, their leaves look like those of potatoes (a close relative), that is, thicker and with smooth, rather than serrated edges. Still, a lot of great-tasting tomatoes are not potato-leaved. uniform red color. Or tomatoes that don’t ripen to perfectly round orbs. 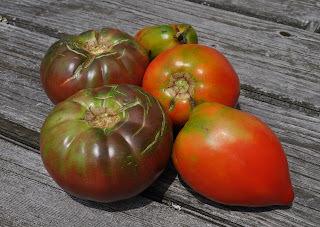 I also happen to like dark colored -- so-called “black” -- varieties. You could almost say that the uglier the tomato (by commercial standards) the better the flavor. Which is not to say that every tomato variety bearing ugly fruits is great-tasting; but it’s a start. A man (or woman, or child) can grow only so many tomatoes. This year I narrowed my lineup to 16 varieties, some old favorites and a few new ones, the new ones chosen on the basis of being indeterminate, perhaps potato-leaved, etc. cooked and fresh), Rose de Berne, Valencia (orange fruit), and Nepal. Also two cherry tomatoes, Sungold and Gardener’s Delight. The latter was my favorite decades ago and I’m curious now how it compares with the incomparable Sungold. New varieties for this year are Brandywine Black, Black Prince, Cherokee Chocolate, German Giant, and Black Krim. Whew! That’s a lotta’ tomatoes. Even with a greenhouse, indoor planting space is at a premium. Besides those 16 varieties of tomatoes, with plans for at least 4 plants of each variety, I have dozens of other vegetable seedlings -- broccoli, lettuce, kale, Brussels sprouts, pepper, eggplant, and more -- growing or in the works. And multiple varieties of each. I’m managing all this by starting out sowing seeds in what look like miniature fields. These “fields” are 4 by 6 inch seed flats, filled with potting soil into which I press 4 furrows with my MFT (my “mini-furrowing tool”). MFT is a 4 by 6 piece of plywood with a handle on its upper side and four, spaced out, 1/4 inch diameter dowels glued to its underside. Into the furrows impressed by the dowels I sprinkle the seeds, cover the furrows, and then smooth the “field” with a similar plywood rectangle lacking the dowel underbelly. The seedlings, when they sprout, look like miniature fields of plants. A lot of seedlings in a little space. into a waiting hole I’ve dibbled with my cone shaped “dibbler.” As each seedling is in place I tuck potting soil in around its roots. 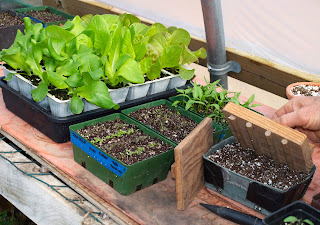 Without delay, once a tray of seedlings has been pricked out, I spray a gentle but thorough mist of water to moisten the soil and settle the little sprouts into place without knocking them down. Seeds and very young sprouts spend one or more weeks -- four in the case of slow-germinating and growing celery -- in the seed flats, and then another four weeks or so in their cells. That translates to 50 or more seedling in an area 4 by 6 inches for a couple of weeks and then about 20 older seedlings growing up in a space of about a square foot for the next four weeks. All this not only squeezes oodles of seedlings into relatively small space; it also keeps me intimate with them in their youth. I’ll be planting tomato seedlings out in the garden one week after the ADLKF. Kale is one of the few vegetables that tolerates heat in summer, cold in winter, and every temperature in between. You can just keep picking the lower leaves as new ones keep growing up top. Neither broccoli, cauliflower, cabbage, nor other members of kale’s family can keep up production like that. And other greens, like lettuce, arugula, and mustard, send up seed-stalks and lose their flavor when days get long or hot. The kale in my greenhouse is now sending up seedstalks but the leaves taste as good as ever. 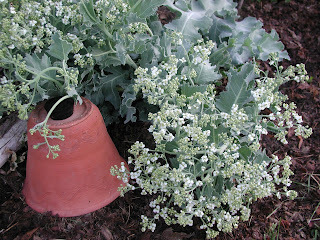 Even the flower-heads themselves, which are like small, loose heads of broccoli, taste good. Although one sowing, in early spring, could keep me in leafy greenery almost all year long, I do three sowings. The first, in early spring, is for planting out in a few weeks for eating from late spring on through summer. Sometimes, usually, I’ll sow again in July for even more greenery well into autumn and, depending on winter temperatures, into winter. The shorter plants of this later sowing are more apt to be covered by snow, which insulates the leaves and keeps them fresh all winter. In August I sow again for planting in the greenhouse, which gives us fresh kale until spring. If I had to grow only one vegetable, kale might be the one. (I have a friend who does grow only one vegetable, and it is kale.) Besides its ease of growth and its longevity, kale packs a powerhouse of nutrients: vitamin C, vitamin K, calcium and all those other good things found in cabbage kin, and vitamin H (I made that last one up, but kale no doubt contains a lot of not-yet-known goodies also). 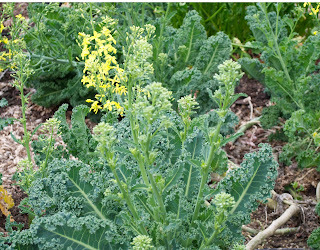 Seakale (Cramb maritima) is another “kale” I grow. This one might be good eating; I have yet to taste it even though I had it in the garden for over a decade. 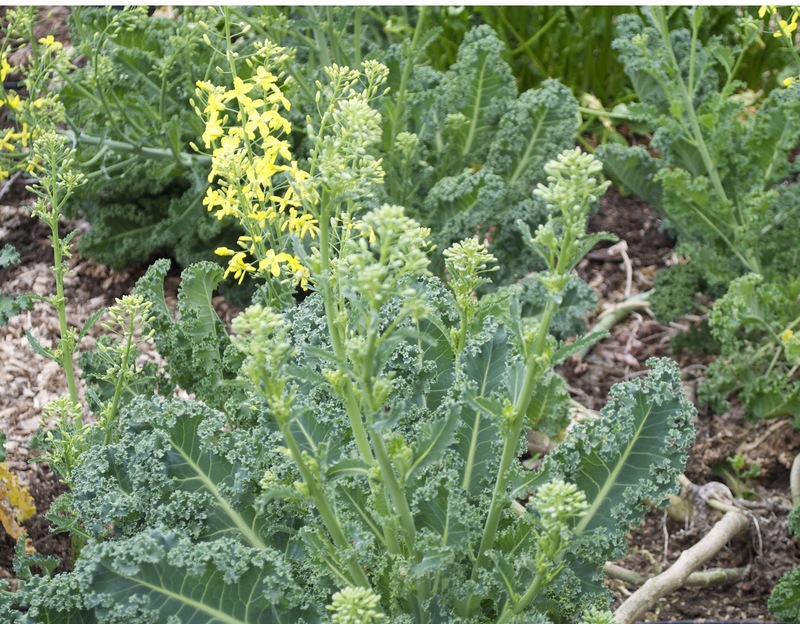 Besides being a different plant from kale, it is functionally different in that it has a short season of edibility, in early spring, and it is a true perennial, so potentially never needs replanting. Mine needs replanting this year because, for no apparent reason, it died last year. 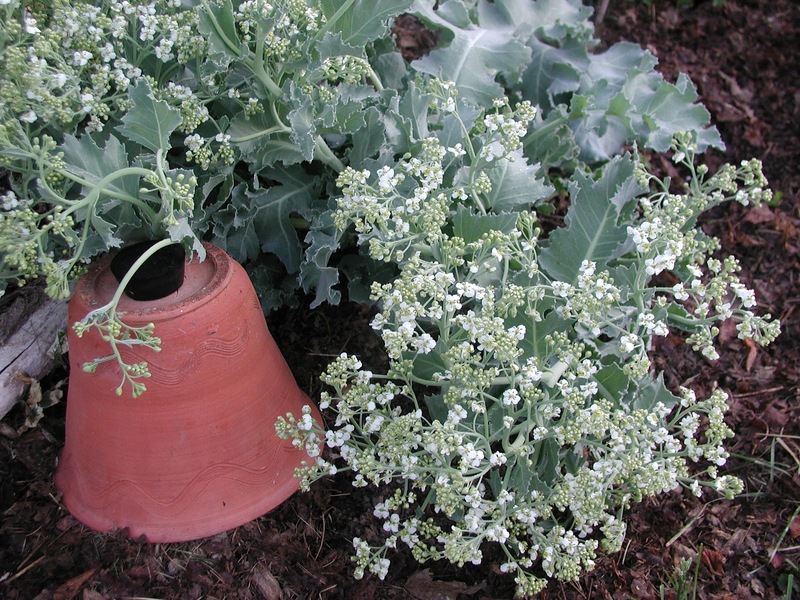 Seakale is a salt-tolerant plant native to coastal regions of northern Europe, and it was in those regions that it was first moved into gardens for cultivation as a vegetable. Young shoots need to be blanched (grown in the dark) -- by being covered with an upturned clay flowerpot, for example -- to make them palatable. The blanched shoots are very tender, so you might never see them in markets. They should make a nice garden or farmden vegetable, though. I have yet to taste seakale because each spring I’ve never got around to blanching it. Blanching can’t continue too long or the roots will be starved for energy, which comes from sunlight. Seakale pulled its weight in my garden in other ways than putting food on the table. Its livened up one corner of the perennial flower bed with its silvery green leaves from which arose, in early summer, loose sprays of small, silvery white flowers, almost like the ocean spray in seakale’s native haunts. I never ate the plant because I didn’t want to weaken it and possibly tone down its spring and summer show. I sowed new seed this week. growth, longevity, flavor, hardiness, and nutrition. Seakale beet, as it is known in Britain; known as Swiss chard here. I plant chard just as I do kale, except less of it because it is less nutritious than kale (high oxalate concentration limits its availability of calcium), slightly less cold-hardy, and I happen not to like its flavor as much. 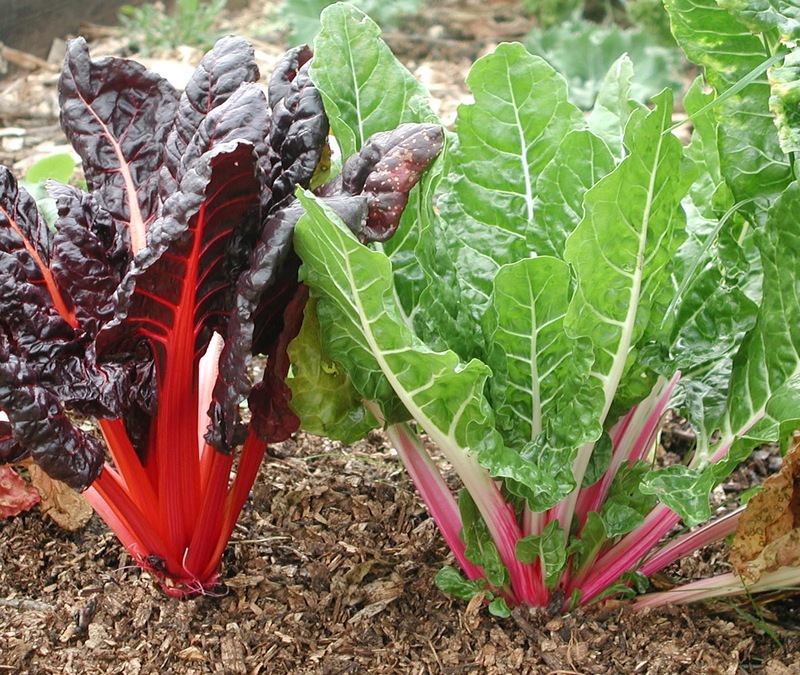 Seakale beet, or chard, is closely related to beet. In fact, both are the same genus and species. 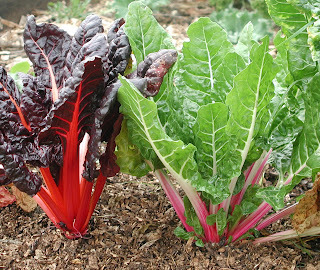 Chard is a beet with extra large leaves and an extra small storage root. But beets are another, story, an underground one. 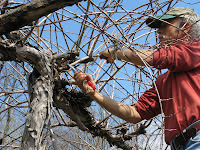 I’ll usually do a little pruning in autumn, after leaves fall, but mostly I’ll be grabbing pruning shears, loppers, and saw as I go out the back door in late February or March, after the coldest part of winter is over. Waiting is most important with plants that are least cold-hardy because these plants tolerate cold better if left alone and, by waiting, I can see what has been damaged during winter. 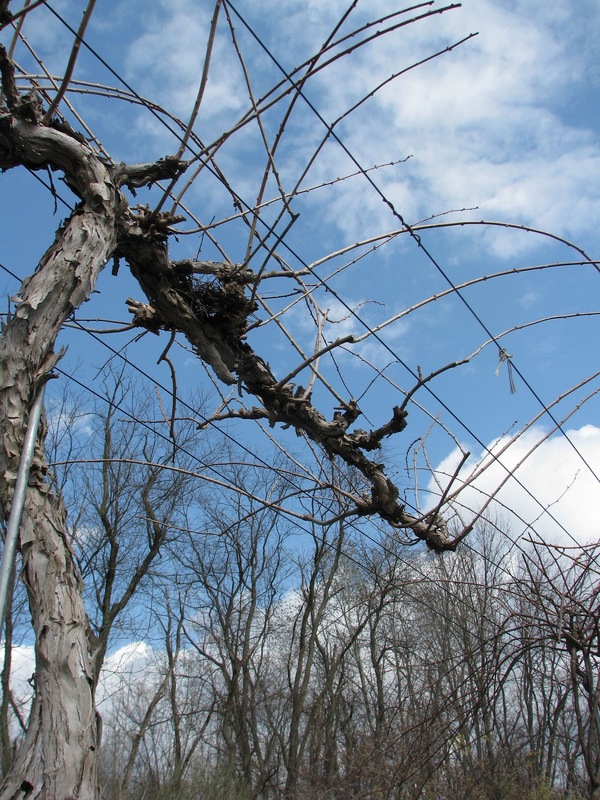 Buds on damaged stems aren’t swelling up this time of year so those stems can be cut off. A few plants warrant dragging out that waiting period even longer, until they are in bloom, which is when they heal quickest. Peaches are prone to infections at wounds, pruning or otherwise, making these trees good candidates for waiting. 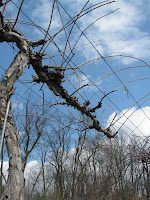 I may also wait to prune my grape vines until new shoot growth is underway because then they are less likely to bleed sap. Bleeding sap worries many gardeners. Isn’t the plant suffering from that gaping wound oozing a watery fluid? 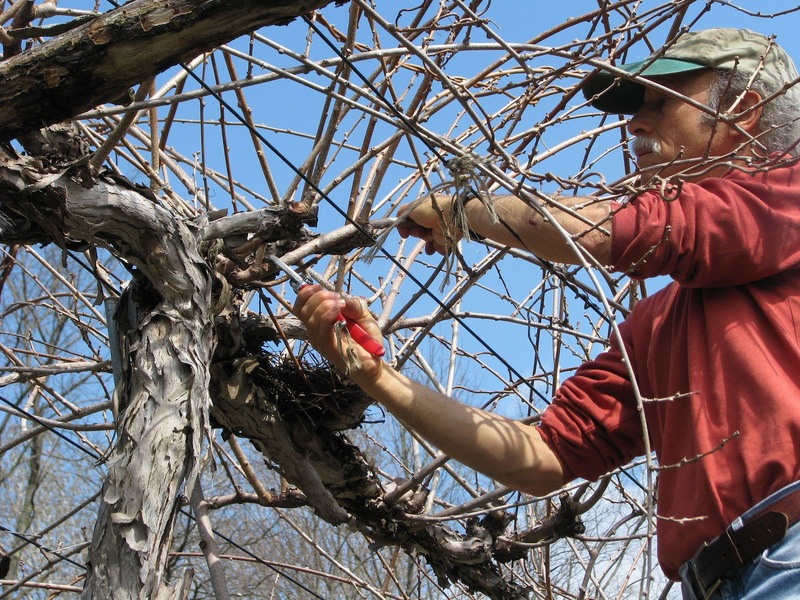 No, bleeding does no harm to grape vines. But some of my grapevines climb along the arbor over my patio. It’s very pleasant to sit outdoors on that patio on warm, spring days; it’s very unpleasant to sit there with sap dripping on my head. Kiwi vines also bleed. No matter. My kiwi vines climb a strictly functional trellis below which we don’t sit. Bleeding is most welcome from maple trees. What comes out this time of year is a dilute, sugary sap that, when boiled down to concentrate the sugars, yields maple syrup and, if boiled down still more, maple sugar. Sugar concentration in the sap can vary, depending on such factors as temperatures, age of tree, site, soil fertility, and moisture. 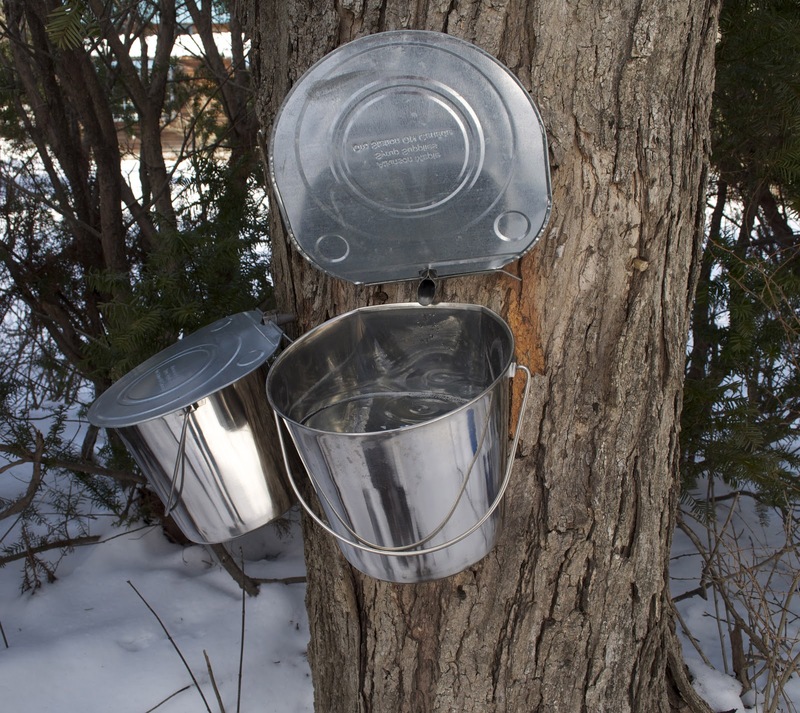 Typically, the ratio of sap to finished syrup is 40 to 1. It’s not root pressure that’s forcing sap out the spiles I’ve tapped into holes bored into two sugar maples. 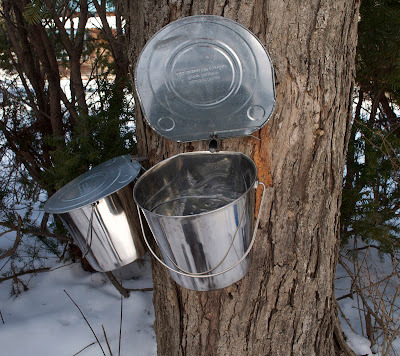 Maple sap runs best when temperatures fluctuate between 20-something degree nights and 40-something degree days. Cooling temperatures cause gas bubbles in the trees xylem cells (the inner ring of trees’ cells in which liquid is conducted upwards from the roots) to shrink and to dissolve. Something’s got to fill that newfound space, so more liquid is sucked up from the roots and into the cells. As temperatures drop further, ice forms and gases are locked within the developing ice. Come morning, pressure builds in the cells as rising temperatures melt the ice and release the gases, forcing liquid out any holes in the bark. That liquid makes its way out the spiles, thence to buckets hanging beneath the stiles, and finally to a large pot that sits and steams on my woodstove through February and March. When the sap reaches 67% sugar, boils at 219° F., or tastes like maple syrup, it’s ready to be bottled up. For me, this has been a good year, with over 5 quarts of syrup already from only 4 taps. Only a few trees can be tapped for their sap. Any maple can, as can black walnut and butternut. Each yields a syrup with a different flavor. 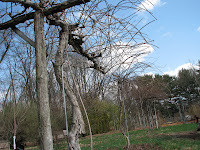 Birch trees also release a sap that can be boiled down to make a tasty syrup; in this case, though, it is root pressure, as with grapes, that forces out the sap.